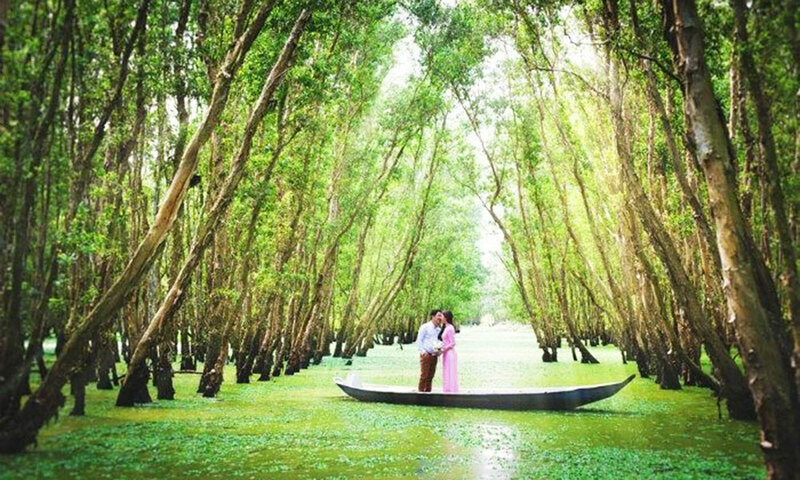 During your journey to Mekong Delta in the South of Vietnam, there is one the most famous flooded forests that leaves a great impression on any tourists’ mind: Tra Su Mangrove Forest or Tra Su Cajuput Forest in An Giang Province, just 25 km southwest of Chau Doc City. Normally, the local boatmen and tour guides advise tourists to visit this enchanted paradise in the high water season from August to December when the whole area is covered by the cajuput forest allowing boats to ride around there. But from my own experience, traveling to the Mekong Delta and the Vietnam tours from Australia should be from November to January for the most pleasant weather conditions with less rain than other time of the year. Tra Su mangrove forest is a flooded forest ecosystem formed by the construction of a special dyke system in An Giang province, belongs to 3 communes: Van Giao, O Long Vy, Thoi Son (Tinh Bien district, An Giang province), only 10 km from Vietnam – Cambodia border. Being directly affected by floods in the Mekong River annually, Tra Su forest plays an important role to prevent unusual flooding: when the flood level increases, the long roots will partially absorb the flood water and the vast area of mangrove forest may weaken the storm and flood. Apart from being a huge air-conditioner to provide the clean atmosphere for the whole area, this is also an ideal shelter of 140 types of flora, 70 species of birds, 11 types of animals, 25 species of reptiles, and 23 kinds of fish making the forest a nature lover’s dream. In addition to the rich natural resources, Tra Su forest also has its own unique cultural elements from the community living along the forest with many traditional handicrafts such as brocade weaving, thot not sugar making, melaleuca oil distillation, bee honey keeping or fishery for living or tourism activities. Having a chance to visit Tra Su forest, tourist will be surprised by the surprising peace but the lively life that not every place has. I came to Tra Su in the late afternoon of mid-December and immediately fell in love with the stunning landscape dyed in warm sunshine and painted in green duckweed. The journey at Tra Su forest may start from getting on the big motorboat for up to 20 people which departs from the entrance of forest and moves along the cajuput forest for tourists to admire vast greenery including lotus and water lilies before they get it off and be transferred to a small rowing wooden boat, which sails you through green duckweed and deep into the forest for around 30 minutes. On the small boat of only 3 people, the boatmen will sail you very slowly for your opportunities to catch the most memorable photos of floating on a living carpet of green water where sometimes we must remind ourselves that we are not on the real road but a waterway. When the sun hides away behind the tall cajuput trees is also the time to pass a plenty of water birds storks nesting in the specialized forest. I told myself to stop breathing for a while to keep the silence of the natural lives here because I am afraid that they will fly instantly when knowing our presence in their habitat. For the best wildlife photographs, luck and patience is the most important thing with the help of a good camera. When a bird looks like it is taking a rest, descending or about to do something exciting, be ready with the burst mode to catch the bird in movement. Soon the small boat finished its round, my wish was to sit in boat for the whole day to keep the most romantic sceneries in my eyes. When reaching the stopping point, we can choose to stop at the 25 meter high watchtower to see the deeper view of the whole immense forest and the birds coming home after a busy day, enjoy the unique drink of the Khmer Seven Mountain called sweet “thot not” drink and hunt the fabulous moment of the sunset and the dawn here. If visitors would like to try the great specialty of the locals, the tents on the edge of the forest is a nice stop for you to be served the South River’s best food such as roasted fish grilled fish, chilli salted fish, fried fish wrapped in lotus leaves, grilled crab dip, tamarind casserole in the space. Endowed with peace and tranquility, Tra Su Forest will certainly become a unique and attractive destination for tourists who love the beauty of nature so do not hesitate to give it a try and share with me your nice photos. Perfume Pagoda or Huong Pagoda has long been regarded as the most famous pilgrimage site when you travel Vietnam tours and it also attracts non-religious tourists because of its beautiful scenery called: “Supreme cave under the southern sky”. Located nearly 70 km southwest of Hanoi, in My Duc District where is the junction of the Red River Delta ends abrubtly with the steep-sided limestone hills rising from the green paddy fields, Perfume Pagoda is an ideal day trip for anyone to enjoy fresh and peaceful atmosphere out of the busy city. Unlike any other religious sites, Huong Pagoda is a complex of pagoda, temples, associated with mountains and forests that brings the harmony of natural and artificial beauty. The center of the complex stays inside the Huong Tich Cave where the Inner Pagoda locates. From the 1st to the 3rd lunar month or from early February to early April is when the Huong Pagoda festival takes place, there is a huge number of pilgrims flow to this site to pray for their happiness and prosperity for the new year. 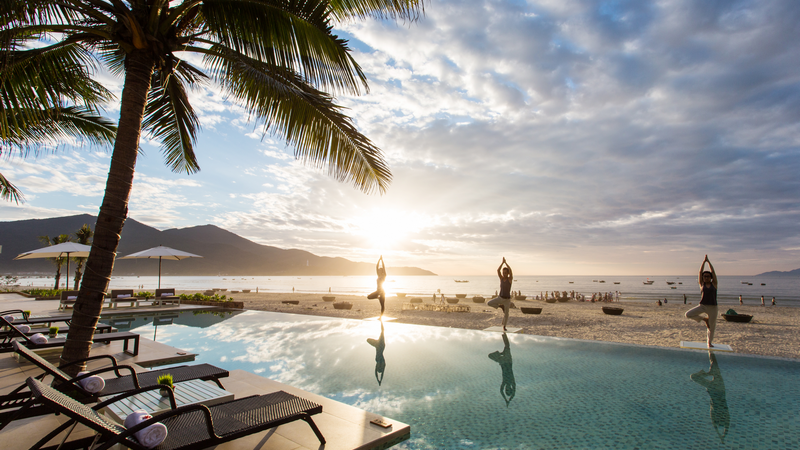 Also, gathering in this spring festival, young people have a lot more chance to join in traditional activities and to find their partners because the legend tells that this magical site is an ideal place to begin a romance. It can be said that Perfume pagoda is a must see place not only because of the religious site but also a stunning place for sight-seeing and photo-capturing lovers. From my real experiences to Huong Pagoda twice, if you only have one day for sight-seeing, you are highly recommended to visit Huong Tich Route to two sites: Thien Tru Pagoda and Huong Tich Cave. The very first starting point of Huong Tich Route is Ben Duc (Duc Pier). During the annual festival months, Ben Duc is packed of thousands of row boats used for shuttling visitors from the Pier to the base of Perfume mountain where people can start climbing to the cave. This one-hour boat ride on the Yen Vi Stream from Pier Duc is actually the most romantic and scenic moments in the trip to Perfume Pagoda. While traveling along Yen Stream, the boat men will sail tourists pass by stunning landscape of blazing green rice paddles with jagged limestone mounts to the base of Huong Mountain. Your “local guide” that is the boat men may tell you about many legends and stories relating to the mountains at the two sides of Yen Stream and with your own imagination, you can easily see on your left the image of Phoenix Mountain, Cat and Turtle Hill and Elephant Mountain. Before boarding Tro Wharf, do not miss to take photos of stunning landscape of the blue sky and green water in the peaceful atmosphere where you can only hear the sound of water sailing. 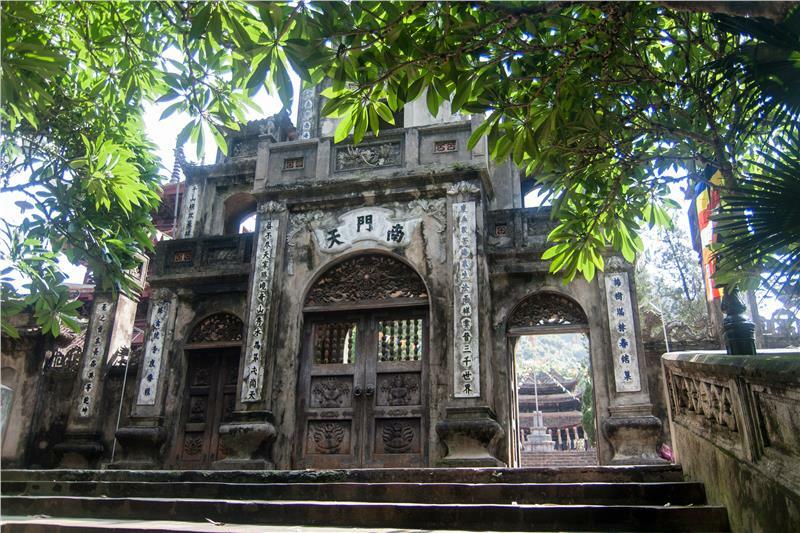 After leaving the boat to step inland, you may not ignore a visit to Thien Tru Pagoda (chuà Ngoài – Outer Pagoda), which was under King Le Thanh Tong dynasty since 18th century. 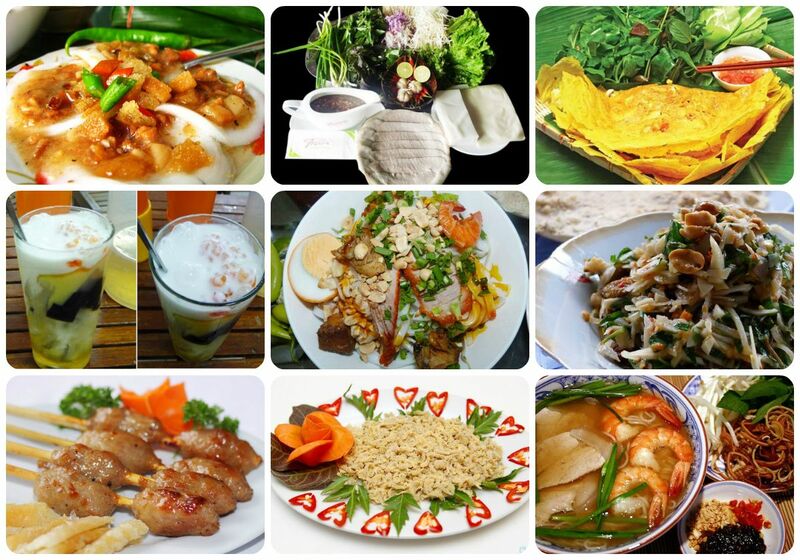 “Thien Tru” literally means a heaven kitchen, derived from the imagination of the locals in this region, of which the rock formations in this area look like chefs busily working in the kitchen. To the right of Thien Tru Pagoda, there is a small path leads to the steep uphill for 4 kilometers to the main Perfume Pagoda that dedicated to Quan Am (Woman Budha). For this route, depending on your physical health and interest, you can choose either walk up the mountain for 1 hour or get in the cable car for just a few minutes. In fact, the hike is hard going and hot due to the high and steep steps and can be highly treacherous for the way down during wet weather and when you are already tired after climbing up. However, the chance to challenge yourself and to enjoy the sceneries along the route especially when on the top, it is actually rewarding. Otherwise, while getting out of the Thien Tru Pagoda, you will find at your right side the cable car station that runs all year round even when in the low season and the panorama from your seat is rather spectacular. After climbing up hundreds of stone steps, and then down 120 stone steps to Huong Tich Grotto whose name literally means “traces of fragrance”, you will be cooled down by the winds and the moisture in dim light along the path to Huong Tich. For any first-time tourists when reaching the grotto, a big “Wow” by magnificently luxuriant landscapes will not be stopped. Behind the natural huge grotto looking like the Budha, the little wet path may take you to discover numerous stunning stalagmites and stalactites inside the cave such as Dun Gao (Rice) rock, gold and silver trees, Nui Co (Girl) and Nui Cau (Boy) Mountains (in the shapes of a girl and a boy) and the most scared place of the whole complex with the statue of Quan Am and Lord Budha. As the festival season falls for the spring time from February to early April, my advice is to avoid this time of the year, instead, you can visit in low season for the autumn and the winter to enjoy pleasant weather and peaceful atmosphere. Especially during October and November, you can easily see lovely water lilies booming up with bright color floating on the Yen stream while on the boat. To enjoy your trip the most, whether you are not planning to walk but do the cable car for driving up, do not forget good walking shoes, a hat and plenty of water, especially in the hot summer months. If you do not have time to prepare them on your own, you can buy mineral water, food and fresh fruits along the way to Huong Tich cave. A good camera is always a must! I hope my sharing will be useful now for your getting started. Let’s enjoy and share with us your great moments. Our team had a very interesting experience exploring on our trip to Lao Cai province in October 2017 and would like to share some pictures to you.Our train starts from Hanoi station at 10.pm on Friday and arrives Lao Cai Station at about 6am on Saturday morning. The weather in the early morning is still warm with a bit misty. Our group is welcomed by our drivers and tour guide at the station. We had light breakfast with Chicken soup at a small rest stop near by and then head up to Simacai District. It takes about 2 hours to transfer from Lao Cai Station to the place where the market is situated. The road sometimes so craggy cause we have to cross over some landslide area from the flood few days ago. Arriving the market at about 8.30 am, the time when the market is most crowded, we jumped out of our car and be impressed by many sounds and smells that can only be found at a fair in the northern Vietnam. The market can be divided into 3 main areas: selling foods, cows and buffalo, clothes and other housewares. Spread in front of our eyes are a living, interesting, unique activities. In this corner, a woman selling some vegetables is talking with another woman carrying a baby on her back by their own language and laugh out loud. Whilst another man is trying to lead his buffalo. It seems like the buffalo is not so happy, it keeps shaking its head, so the bamboo bell on his neck makes some noise. Under some wooden roofs, some people are cooking special dishes made from organs of pigs, cows or buffalo. In another corner, some men is making BBQ with beef and vegetables. An old woman is cooking a big pan full of a white mixture that they call tofu. Some people are selling special wine made from tao meo – a special type of fruit in the jungle. Some children is gathering by the pannier full of hot colorful sticky rice. The color is made from 100% natural ingredients. Some teenage girls are trying the handmade dresses. In a lower land, cows and buffalo is gatherings and their owners are trading. All things creates a vivid pictures. The words can not describe enough, so you would better come and experience by yourself. The market is not fit with all people, but it is a great choice for someone who really like to see local things. Just a tip is the Can Cau Market will be finished at about noon, thus you better arrange your time well, so not to miss the most interesting part of the market. Also, don’t forget to check the weather and bring your warm coat cause at that night the weather changed dramatically, temperature cool down to just about 12-13 Degree. Noodles for breakfast, who’s willing to try?